Like through much of Ireland on this day, it was raining hard at Hill Of Down, so the first thing we did was sleep in awhile. 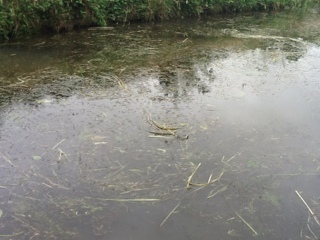 We listened to the radio weather forecaster telling us of flash flooding around the country, a bit of a change from the reports of droughts and water shortages we have heard from time to time during the past week, including water shortages in the canal we are on. 11:50 am, we reluctantly set off from the quaint, useful and very friendly Hill Of Down village to enter a very long open, remote and winding section of canal. 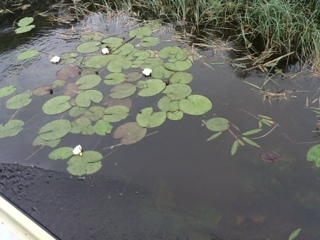 Along this stretch the water lillies changed from the usual yellow lillies to large white lillies, and some of them with light lilac tips on the petals. 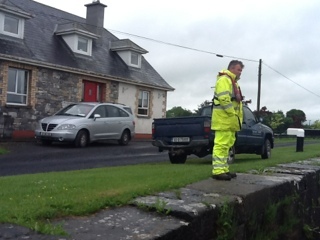 1:20 pm, arrived at Thomastown Bridge, the start of a series of 8 locks in the Killucan are. First priority, have lunch. I noticed that at the other side of the first lock, lock 19, there was a modern plush and state of the art Ireland Waterways building and was curious to see if this was also closed due to health and safety reasons. 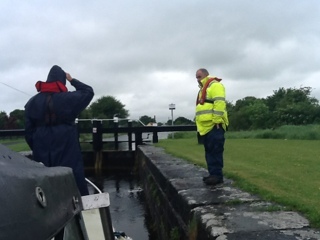 3:00 pm, we set off from Thomastown Bridge and with the help of these excellent Ireland Waterways men smoothly passed through locks 18, 19, 20, 21, 22, 23, 24, 25. 4:50 pm we had passed through all of these locks and was on our way through what is known as the summit stretch of the Royal Canal. 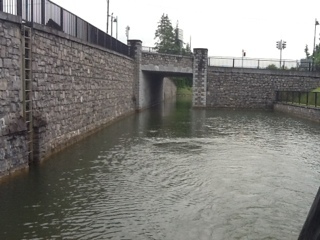 5:20 pm, we sailed under the raised drawbridge near The Downs. 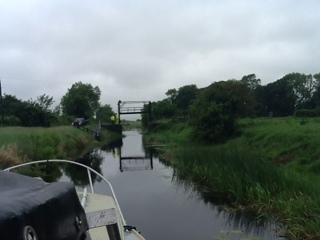 Through today we had been impressed with how the Royal Canal was wider, well maintained and much more weed from than the Grand Canal.Alas, as we entered a beautiful winding cutting between Baltrasna Bridge and Moran's Bridge, outside Mullingar, we were into the worst weed density we have had so far on this waterways journey. The weed was just like one long rafia mat. Our prop was bunged up and had to be untangled three times. This delayed us considerably. 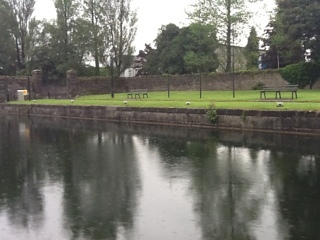 8:30 pm, finally cruising through the centre of Mullingar town and the canal was again wide and clean of weed. 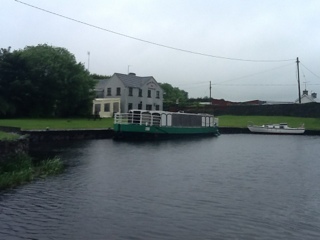 Mullingar harbour has one of the finest harbours and boater's facilities I have seen so far on the Irish Waterways system. Alas, the Irish Waterways men advised us "don't moor up there, its dangerous, moor up out of town where there are no vandals". Sure enough in the middle of the canal by this beautiful marina and facilities the handles of a shopping trolley stuck up out of the water, ready to rip the hull of some passing boat. Again, it saddens me that this new healthy tourism industry trying to establish itself is threatened this way. 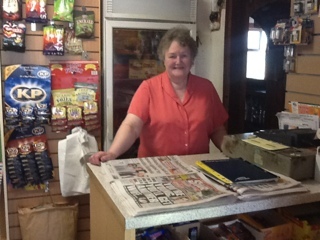 Having said that, I notice that there is no vandalism, no graffiti, on any of the Irish Waterways property and grounds, at each harbour, which are all very well kept. 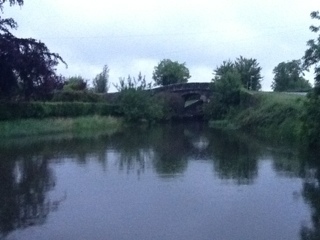 9:45 arrived at Ballinea Bridges and moored up for the night.